I’m not a professional beverage reviewer or anything like that. I do like better beers than the standard big name p*ss water ones though, and I’d rather drink water than those. One of my favorite beer types is the Hefeweizen, and I’ve sampled dozens of beer makers’ renditions. 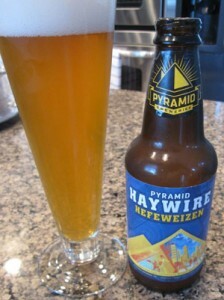 I quite enjoyed my six pack of Pyramid Hefe’s over the last week or so. They’re not too heavy, easy to drink and have a unique but still hefe taste. I was only able to find these out of my home state and I brought some home. Unfortunately, I’m now out of them. Boo.